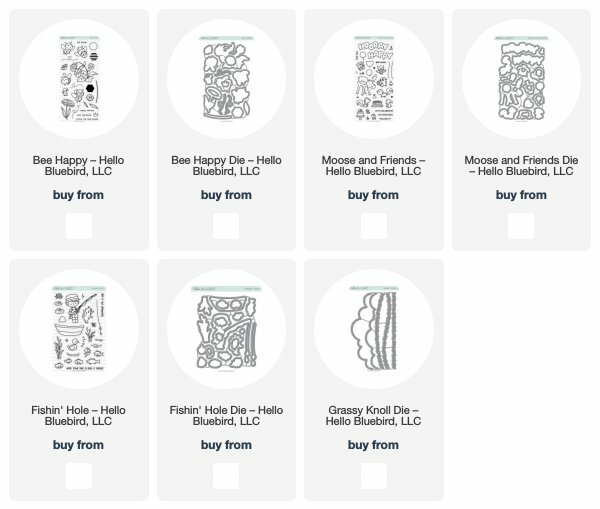 Hi friends, today I'm here to share three projects I made for Hello Bluebird. I'll be using the brand new July Release including, Fishin' Hole, Bee Happy and Moose and Friends. These sets are so super cute and I'm excited to share what I created with them. 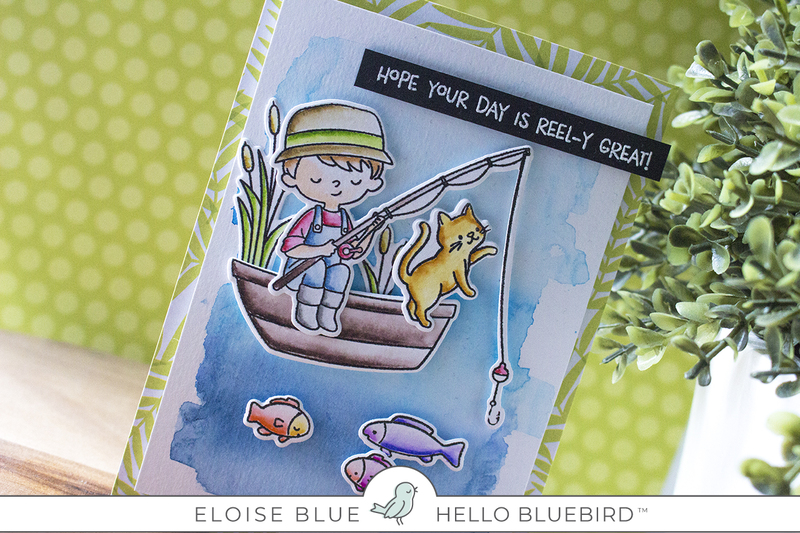 For my first card, I used the Fishin' Hole Stamp Set. I stamped out the images and coloured them in with Zig Clean Colour Real Brush Markers. 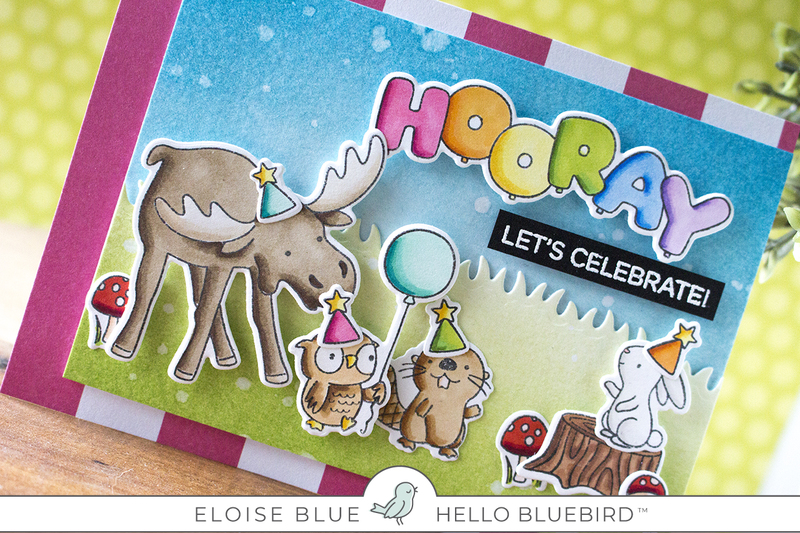 I die cut them out using the coordinating dies and set them off to the side to work not the background. I used my Mijello Misson Gold Watercolour Set and did stripes of blue watercolour for the background and then I dried it off with a heat tool. I then added foam tape to the backs of all my images and adhered them onto my background. For my sentiment I white heat embossed the 'Hope Your Day Is Reel-y Great!' sentiment onto a thin strip of black cardstock. I also popped that up on more foam tape and adhered it to the right hand side. 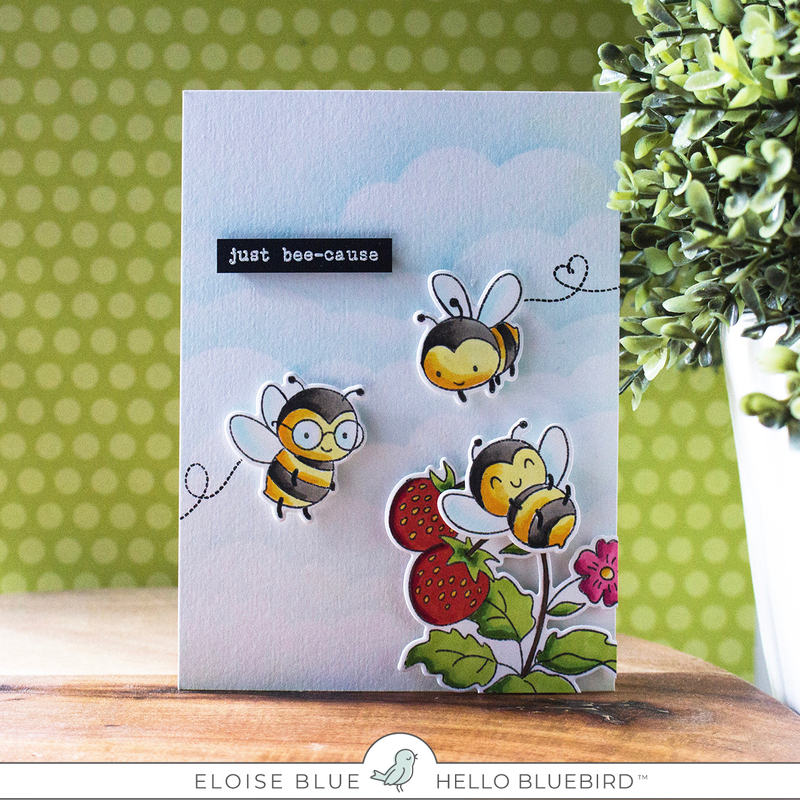 To finish off my card I adhered my panel onto a piece of leafy patterned paper and my card was complete. For my second card I used the Bee Happy Stamp Set. I stamped down my images onto some white cardstock and coloured them in with Copic Markers. I used the Coordinating Dies to cut them out and set them off to the side. For my background I took a piece of watercolour cardstock and ink blended some cloud shapes onto the background using a stencil. 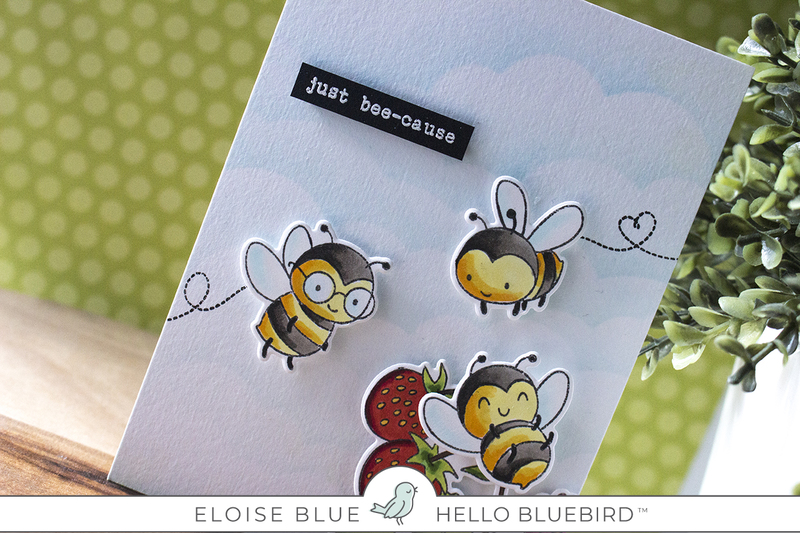 I then adhered my images onto the background using foam tape and also stamped a couple of trails behind the bees. I cut off the excess on the strawberry plant so it would sit flat on the card and then I white heat embossed the 'just bee-cause' sentiment onto a thin black strip of cardstock as well. I added foam tape onto the backs and that finished off my second card. 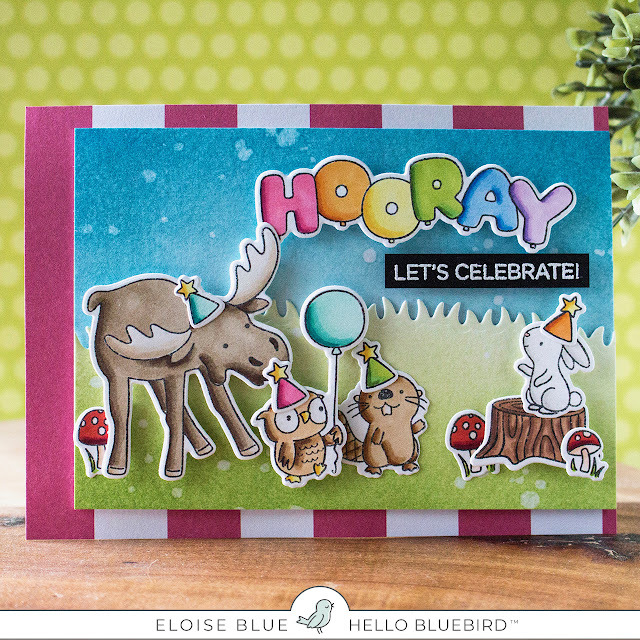 For my third card, I pulled out the Moose and Friends stamp set, I stamped down the images and coloured them in with Copic Markers. I cut them out using the dies and set them aside. For my background I used the Grassy Knoll Dies and cut out a piece of watercolour paper with one of the grass hill dies. I then used Distress Inks to ink blend the sky and also the grass. I then flicked on some water and heat dried the panel. I then adhered the pieces together using foam tape. Next, I added adhesive to the backs of all my images and I adhered them into place on the panel. For the additional sentiment, I white heat embossed the 'Let's Celebrate' onto a think strip of black cardstock and adhered it underneath the balloon sentiment. To finish up I adhered the entire panel onto a piece of pink striped patterned paper. Thanks so much for stopping by today. 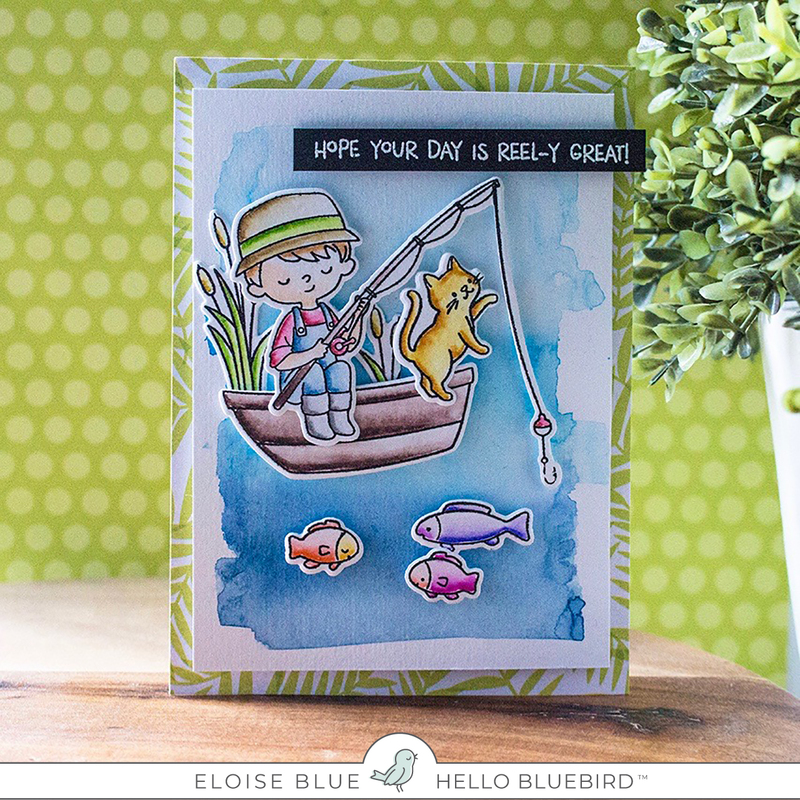 I hope you enjoyed seeing all three of my cards today and got inspired. See you all next time!